The Internet would be even faster and cheaper if more components of the fiber-optic network could be combined on individual chips -- in much the way that computers evolved from room-sized monstrosities to desktop machines when transistors were condensed onto integrated circuits. Chemist Maria Petrucci-Samija has created materials that might soon make such integrated photonic circuits possible. The problem with putting multiple optical components on a single chip is that different components work best when built from different, often incompatible materials. Silica glass is great for shunting a beam of light from one place to another, but its not so good at modulating a signal so that it carries information. Petrucci-Samija has shown that plastics can be molecularly tailored to combine the best of all worlds. "Its really trying to figure out at the atomic level what is necessary to do that," she says. 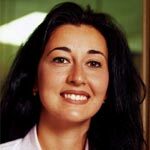 Petrucci-Samija figured it out well enough to produce a polymer as transparent as the best optical glass; this helped the company she worked for, Lumenon Innovative Lightwave Technology, create the first polymer versions of several optical-communications components. Petrucci-Samijas work continues at DuPont, where she heads a team striving to develop new plastics and to combine plastic and silica glass devices on individual chips. She hopes to have marketable components ready for use in optical networks in about three years. Petrucci-Samija says the first use of integrated photonic circuits will most likely be to make network communications more reliable and bring down the cost of equipment. Eventually, though, the same approach could help realize the dream of superfast optical computers.